Have you heard of Brink? It's an online-style action shooter from Splash Damage, the company behind the Enemy Territory multiplayer games based on id Software's Quake and Wolfenstein franchises. It's got the artistic flair and humor of Team Fortress 2 and the enhanced AI and multiplayer muscle you'd expect from a company used to working with id. It's being published Bethesda. It's due for release next year. And it's actually damn good. Brink is the under-the-radar title that could very well put Bethesda on the map as a major publisher (of more than Todd Howard's games). It's set in a fictional, sci-fi inspired world in which you play as either a member of the "security force" or "the resistance." Your objective varies from mission-to-mission, and on-the-fly. In fact, that's one of the cooler aspects of Brink. If you don't like what you're currently set to do, or simply want to see what objectives are available to you, you just press a button. "If ever I'm stuck, if ever I don't know what to do, if ever I'm frustrated," said Richard Ham, Creative Director at Splash Damage, the crazy man giving me a hands-on demo of Brink, "we have a system that's kind of like your best friend who knows the game and sits on the couch with you and says 'Hey, go over there, try that.' I hold up on the D-pad and I get this wheel and it tells me everything I can do right now." Your options will vary depending on your character class. 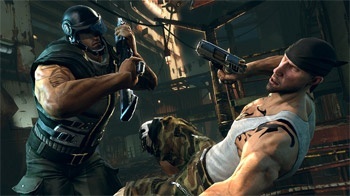 In Brink, you can play as a Soldier ("He blows stuff up," said Ham), a Medic ("He gets a Lazarus grenade which can revive multiple people. "), an Engineer ("He can buff the team's weapons so that everybody does more damage.") or an Operative ("Gets all the cool spy toys."). All of the classes are fun and have unique perks and bonuses which you can improve throughout the game, but it doesn't matter which class you choose because if you don't like the class you're playing, you can just switch mid-game; mid-level if you want. The game features a set piece called the command post. As in many online multi-player games, the command posts are areas you will fight for and want to control, but beyond allowing you to claim areas on a map, the command post lets you select new weapons and change your character class - instantly. Each class can carry different weapons and they will have different objectives depending on the level and whether or not somebody is already doing a certain thing - like hacking a control panel or blowing up a room. The objectives are varied and interesting and once you've selected one, the game's Heads Up Display will always show an arrow, pointing to where you need to go in order to accomplish your objective. "It's like GPS," said Ham. "If you go off in another direction, it will say, 'oh, I'll let you know how to get there from this direction.'" But the most impressive aspect of Brink (at least for me, an inveterate single-player) is the bots. During our demo, the Splash Damage team had custom-created the bots and named them after members of the dev team who were in attendance at E3. Since many of these devs were also giving their own demos, I assumed I was playing against them. Time after time, the bots - named for real people - acted like real people. When Ham informed me I'd been playing against bots, I was astonished. "We worked really hard to make sure our bots had the same tactics as a multiplayer player would do," he said. "This is not a game where they will just patiently wade and cover, and every once in awhile pop up so you can get your headshot. This game is alive and dynamic. They will flank you, they will do all kinds of stuff so you really need to be on your toes." I was playing as an operative and attempting to hack the controls that would lead to an overload of the reactor at the center of the level, a mission Ham, with his characteristic dry, British wit called "a suicide mission ... but that's okay because it's all in good fun." As I darted from hallway to hallway, the enemy, as advertised, attempted to draw me out and outflank me. When I tossed a grenade to clear a room, they just ducked out of range. When I charged in with guns blazing, they fell back seeking cover, drawing me in - until my weapon ran dry, whereupon they riddled me with bullets. Ham suggested I try a flanking maneuver of my own. "You know what you can do?" he said. "Let's flank them. Go down these stairs. The arrow would never tell you about this, it tells you the main way to go. So, still you can explore and find other ways." Following Ham's advice, I ducked down a hidden hallway and soon found myself behind the enemy position - and they were all looking the wrong way. Quickly wasting them, I began setting up my bomb to blow the reactor and my AI teammates arrived to help me hold the position until it blew. Since I was the weakest character of the group, I found a nice place to hide while my soldier and medic teammates held off the enemy. While we were waiting, I asked Ham if Splash Damage and Bethesda were planning a public beta. "We're not talking about that," he said. "I have no way I can answer that." Which, as cop-outs go, was at least honest. He did, however, tell me that Splash Damage has "a history" of doing public betas, and left me to make of that what I will. He then tried to distract me, by pointing out that the timer on my bomb had almost run down, and that the enemy appeared beaten. "None of them are going for the bomb," he said. And then the timer counted down to zero and I exploded - along with the objective. "You made it! You are the first successful suicide bomber. A first in games, I think, by the way. And that's our demo. Tell Yahtzee to say nice things about us."